I have been a die hard fan and a power user of BlackBerry devices for almost a decade now. I now own a Passport and love the device, especially since it is great for emails, calendars, contacts, and, of course, BBHub. RelaxBook Nature - plays relaxing nature sounds for a timed interval. 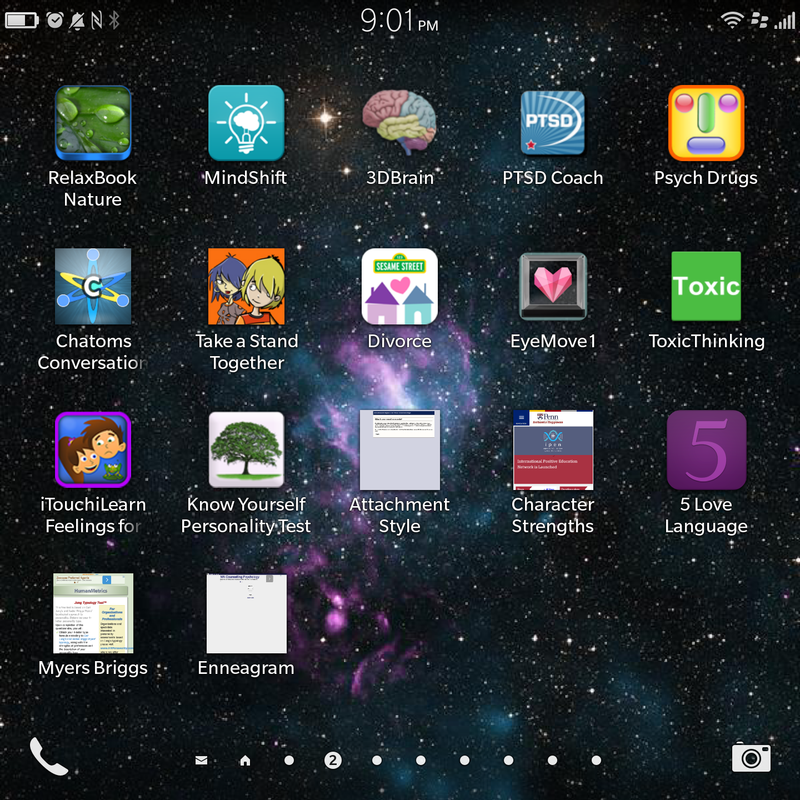 MindShift - made by AnxietyBC, this app provides information, tracking, calming tools, and mindfulness strategies. Psych Drugs - simple information on psychiatric medications; including names, dosage, side effects, and class. Chatoms: Conversation Starters - great and simple way to build relationship, or to help with social skills. Take a Stand Together - anti-bullying app aimed at creating safe and supportive environments. Sesame Street: Divorce - designed for parents to use with their children to help explain and normalize feelings around divorce. EyeMove 1 - simple eye-movement app for EMDR trained therapists. iTouch iLearn Feelings - developing emotional and feelings language for pre-schoolers. Know Yourself Personality Tests - all informal, but informative questionnaires. Solar Explorer - exploring the solar system can help (some) put present struggles in perspective. Or it is soothing. Days Lived - fun app that lets you know how many days you have lived, and time spent doing certain activities. TED - TED talks are awesome and inspiring. Dropbox - all my 'working'/'in-progress' documents are here. Access to my files anywhere at anytime. Workwide - allows for multi-tasking (great for Passport users) by using two windows simultaneously. Tilt - after it's latest upgrade, this app provides instant information at the tilting of the device. Can see recent emails, upcoming events with having to man-handle your device. RSS Savy - all your feeds, one location. BB Bridge - I still rock the Playbook, so this app is great for using my phone as a slide changer. 7-minute Workout - pretty easy to find seven minutes to work out. Countdown - counts down to certain holidays, and also custom dates like birthday's, vacation, etc. I use these self informative tools to help increase my clients Johari Window so that they can understand themselves better, and so I can assist them better as well.